Is your appetite in the way of your weight-loss goals? Now there's a new, all-natural way to help reduce your appetite called Caralluma Burn. 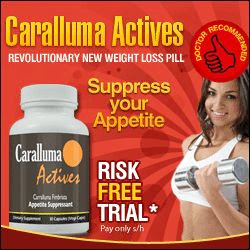 Caralluma Burn contains a revolutionary new ingredient that clinical research suggests helps suppress the appetite. Our guaranteed-potency extract of the Indian herb Caralluma imbriata works naturally in the body to help reduce your appetite so it won't undermine your weight loss efforts. Caralluma safety has been reviewed by three toxicology studies done per exacting OECD guidelines and has achieved self-affirmed GRAS [Generally Recognized As Safe] status.